These juicy portobello steaks are baked (or grilled!) to tender perfection and topped with creamy whiskey peppercorn sauce. 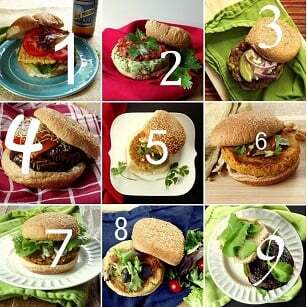 This meal will knock your socks off and is guaranteed to please vegans and non-vegans alike! Even though I was never a big fan of meat in my pre-veggie days, I do have a handful of dishes that stand out for one reason or another as being favorites. At some point I had a steak with whiskey peppercorn sauce. I did not like steak, but I specifically recall the sauce as being heavenly. So I decided to make some and put it on a vegan steak. Portobello steaks are my favorite vegan steaks, and perfect for a punchy, creamy, umami-packed sauce like whiskey peppercorn. Regular whiskey peppercorn sauce is made with cream and butter, so I subbed vegan butter and coconut milk, making the sauce just as rich and decadent as the original non-vegan version. First you’ll melt the butter and use it to sauté some garlic and whole peppercorns. 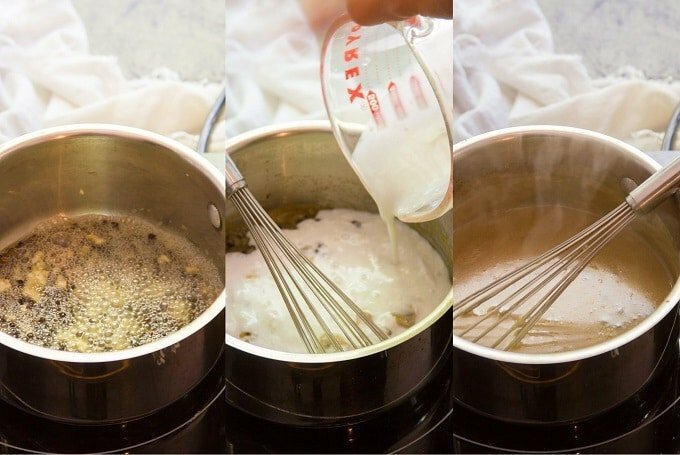 Add some flour to make a roux. This is what thickens the sauce. Important: remove the pan from the burner before adding the whiskey, assuming you don’t want to set yourself on fire. I speak from experience here (no injuries were sustained!). Whisk in the whiskey and return the pan to low heat. Let it simmer for a few minutes before adding coconut milk. I know some people are fans of cooking this sauce lightly so some of the alcohol remains, and I can’t say I’m in that camp. If you are, feel free to cut down on the simmer time. I was inspired by this recipe to add some miso for extra savory flavor. The salty, fermenty taste was perfect with the woodsy flavors from the whisky. 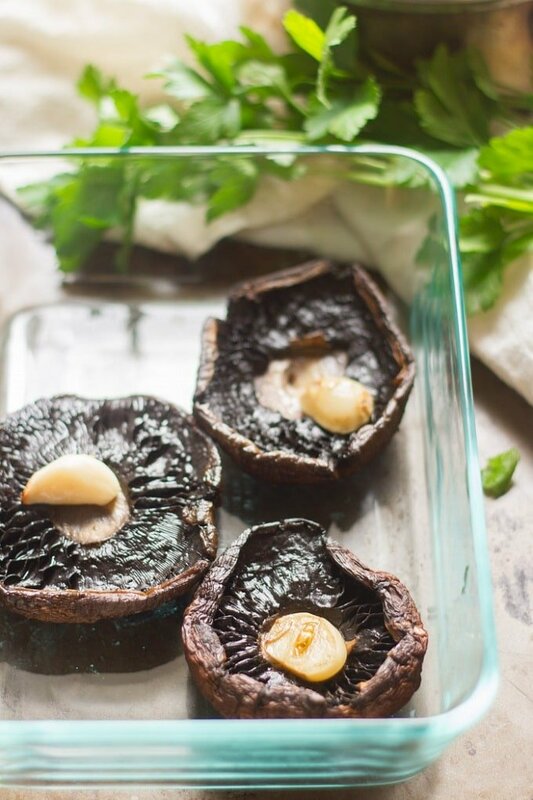 While the sauce simmers you’ll roast the portobello caps in the oven (or grill them! See my notes below. ), and once they’re done, plate them up and smother them in sauce. Clean your mushroom caps by wiping them with a damp cloth. That’s it. Don’t douse them in water! They get waterlogged easily, which will make them cook up soggy instead of tender and lightly browned like you’d want. Look for miso in your supermarket’s international section or at an Asian market. If you really don’t feel like buying some (which I urge you to reconsider), substitute salt or soy sauce to taste. You can grill the mushrooms instead of baking if you prefer. Just place them directly on the grill over a medium flame for 4 to 5 minutes on each side. The sauce goes great on potatoes too, so consider making some extra along with a potato side dish. Begin by making the portobello steaks. Preheat the oven to 450°. Generously rub the outsides of the mushroom caps with oil. Cut the garlic cloves in half and rub the outsides of the mushroom caps with the cut sides of the garlic cloves. Place the mushroom caps into a baking dish, stem side up, and place a one of the garlic clove halves on top of each cap. Bake the mushrooms until tender and browned, about 10 minutes. While the mushrooms bake, prepare the sauce. Melt the butter over medium heat in a small saucepan. Add the garlic and peppercorns, and sauté for about 2 minutes. Whisk in the flour and sauté for about 2 minutes more. Remove the pot from heat and add the whiskey. Be very careful, as the whiskey can catch fire if the pan is very hot. Place the pan back over heat and whisk in the whiskey. Allow to simmer for 3 minutes, until the mixture thickens a bit. Whisk in the coconut milk and miso paste. Bring the mixture to a simmer and allow it to cook for about 10 minutes, until thickened and most of the alcohol has cooked off (taste test for this). Divide the mushrooms onto plates. You can discard the garlic or serve it with the mushrooms if you like (they might still have some bite though!). 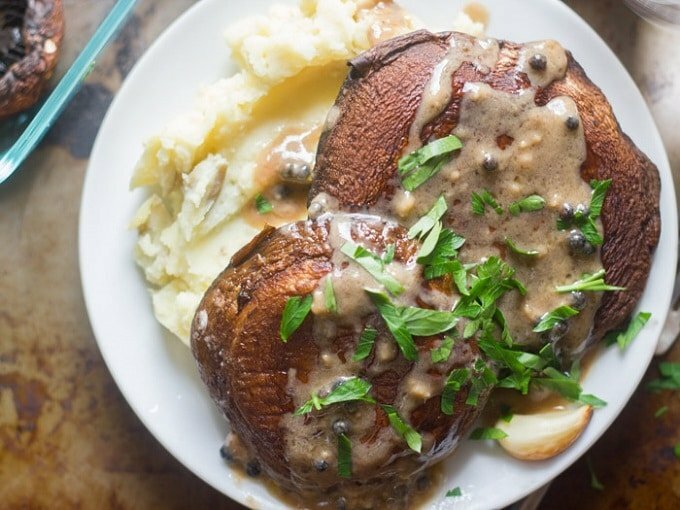 Top the mushrooms with whiskey peppercorn sauce. Serve. The whiskey is what give the sauce its flavor, so I’m not sure how it would be without it. 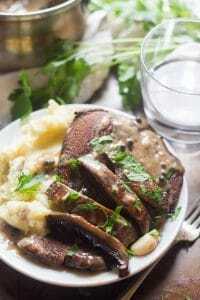 You could try using a basic vegan gravy like this one – https://www.connoisseurusveg.com/vegan-gravy/ I think it would even be good if you added peppercorns. The alcohol will burn off as it cooks. There will only be flavor left when it is finished. Yes! I think if you like the mushroom gravy you’ll enjoy this too. And thanks for catching that – every now and then I miss one. Just added it! Making this tonight! Thinking of using Jack for the whiskey part. 🤔 No coconut milk handy so I’ll just have to settle with the vegan butter. Hope it comes out great. Not making mashed potatoes but I’m roasting some sweet potato and kale…with a side of quinoa and green beans! That sounds like a delicious meal! I hope you enjoyed it! Is that Cilantro sprinkled on the finished meal? I can not see the greens anywhere listed in the tips or actual recipe. 2 questions… 1) do you scrape the gills out before baking/grilling, and 2) have you tried this with shiitake mushrooms? My local Asian market has the biggest plump and fresh shitakes I ever seen! I didn’t scrape out the gills, but you definitely could! I usually just do that for portobello sandwiches. And I think this would be delicious with big shiitakes – I wish I could get my hands on some to try it out! What kind of whiskey do you recommend?